Andrew "Redigit" Spinks confirms that his "mystery project" is indeed a successor to Terraria. Terraria fans who were treated to the humongous, free 1.2 patch earlier this week are in for another piece of good news: Andrew "Redigit" Spinks has confirmed to Rock, Paper, Shotgun that the "mystery project" he initially left Terraria to pursue is in fact Terraria 2. He said that he had originally planned to be about half-way done with it by now, but instead decided to return to the original Terraria in order to deliver the fans the extra content they had been asking for. "I actually planned, when I first quit Terraria, to have been halfway through my next project by now, but it just didn't happen. 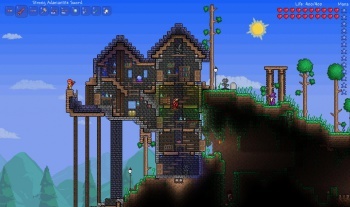 Instead, I decided to work on another update for Terraria to please the fans a little bit." Spinks clarifies that it would be great if he could just keep delivering content to the original Terraria, but the game has its limits. He did, after all, lay the groundwork for the game long before he'd amassed the experience that come with releasing such a successful game, and thinks that he can do better with a sequel. "There's a lot of stuff I'm locked into with Terraria," he said. "The way loot works, the way character progression works. In Terraria 2, I really want to have infinite worlds so you're not just stuck to one world. You can travel anywhere. I want more biome diversity in that, too. There's a lot of stuff [I want to add and change]." Sounds a lot like Starbound (a game, coincidentally, founded by some ex-Terraria team members) doesn't it? As for continued updates for Terraria 1, Spinks says that the 1.2 update will most likely be the last update of its scope to come to the game, but is considering hiring another small team to continue updates while he moves onto Terraria 2.